Through out each month I'll be keeping a skin care diary and jotting down what I use on an every day basis. At the end of the month I'll tally up what has been used the most and share the products with you. I have combination skin that can change between being extremely dry, spot prone, oily and sensitive as well as having eczema flare ups. 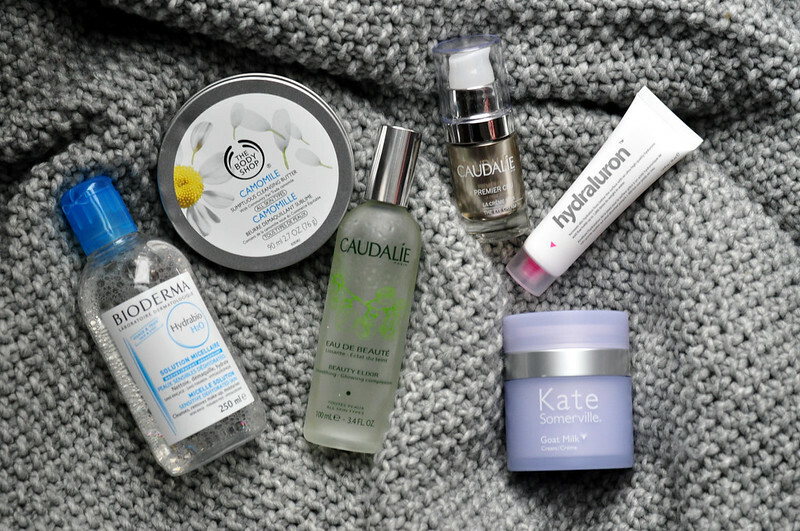 Bioderma Hydrabio H2o Micelle Solution | The Body Shop Chamomile Sumptuous Cleansing Butter | Caudalie Beauty Elixir | Caudalie Premier Cru The Eye Cream | Indeed Labs Hydraluron | Kate Somerville Goat Milk Cream. This months skin care routine is a mix of old favourites, some repurchases and new-ish products. My skin has, touch wood, stayed pretty normal this month in that I haven't had any eczema flare ups and haven't had too many spots. I think I can put this down to me upping my water in take and trying to stick with products I now work well with my skin and avoiding fragrance in products. Synthetic fragrance is one of the things I know irritates my skin when it comes to skin care ingredients so I am slowly working towards a fragrance free routine. I don't want to throw away all of the products I have that contain perfume as that would be a complete waste of money but I am making an effort to check ingredients before I make future purchases. I haven't used Hydraluron since I finished my first tube back in 2013. Why it's taken me so long to repurchase I have no idea as I have fallen back in love with it. It love how my skin looks and feels when I use it and I find my moisturiser always sinks in better after I've used it. What's been your top skin care product of February? Follow me on Bloglovin'// Google+ // Instagram // Pinterest // Twitter // Tumblr.